Notes: Touching on sources such as Bob Dylan and Henry Mancini and Broadway show tunes Stan takes a pop jazz approach to these songs. And his tenor sax is sweet as always. The liner notes by Billboard's Jack Maher draws a comparison between "pop art" and "pop jazz" as it was in 1963. While the art took the ordinary, the mundane and by reworking it or placing it into a new context transformed it into art, the music took music appealing to the widest possible audience and placed it into a framework which allowed the artist to swing, roll and contract or expand time as the mood requires. This is nothing new to Stan who has been playing anything he hears in his own style since the beginning, while never forgetting that the melody is the thing. A small collection of notes, a stutter in time or a note held just a beat longer can make all the difference. 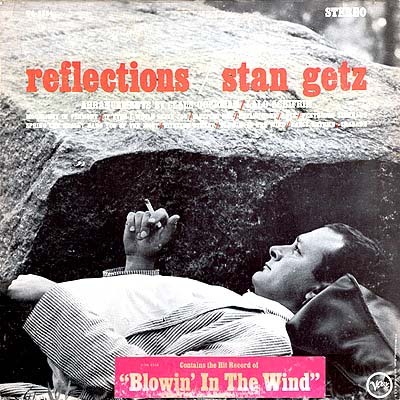 The front cover photo of a reclining Getz, smoke in hand, captures a reflective artist. 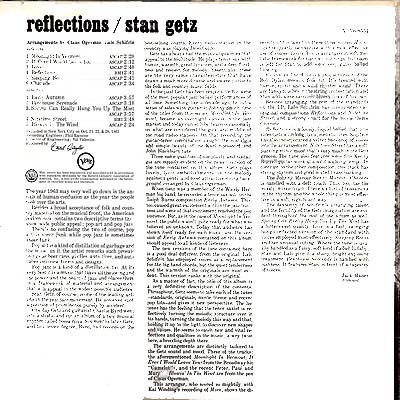 Wonderful slab of wax for the fans of Stan.